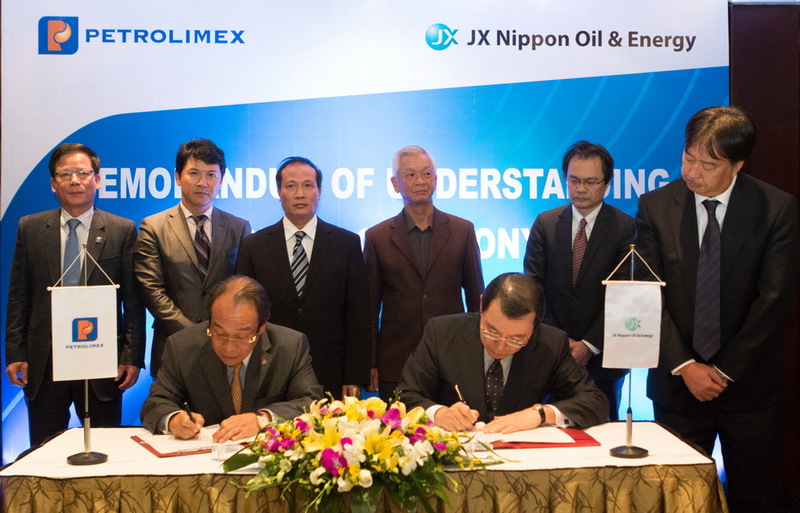 Hanoi December 19th, 2014 – Vietnam National Petroleum Group (Petrolimex) and Japan Petroleum market leader JX Nippon Oil and Energy announced today a Memorandom and Understanding (MOU) that paves the way and defines principles for strategic cooperation between the two oil companies. Mr. Bui Ngoc Bao, Chairman of Petrolimex Board of Management and Mr. Yashusi Kimura, Chairman of JX Holding / JX NOE signing the MoU. According to the MOU, The two parties are revising their final report to relevant authorities to get approval for JX NOE to become a strategic shareholder of Petrolimex through a share issuance package. The MOU also refreshes Petrolimex’s Refinery and Petrochemical Complex project near Vanphong bay of Khanh Hoa province by setting up a joint-venture with JX Nippon Oil and Energy. The joint-venture is to revise the project feasibility study to proceed further steps for business and investment licence. In meetings with governmental and ministrial leaders earlier the same day, Petrolimex and JX top management reported their progress and suggested key solutions to push the projects forward. The strategic cooperation is believed to set a milestone for both JX and Petrolilmex future development. Legal procedure for the share issuance and obtaining joint-venture business licence is scheduled to be completed by mid 2015.